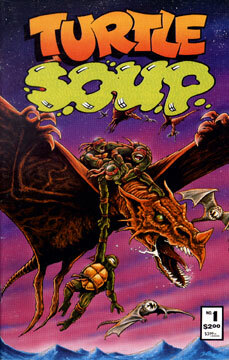 This was the original one-shot anthology book that featured a bunch of different artists/writers telling TMNT stories and included a handful of pin-ups. A few years later, Mirage relaunched the anthology for 4 issues. “Turtle Dreams” by Steve Bissette. 8 pages. “Pesticide” by Bella. 2 pages. “Turtle Soup and Rabbit Stew” by Stan Sakai. 6 pages. Usagi Yojimbo meets Leonardo. “The Howl” by Eric Talbot. 4 pages. “Showdown” by Jim Miller and C.A. Stormon. 6 pages. “Apparition” by Francis Mao. 10 pages. “You’re in the Army Now” by Bernie Shuman and Danny Shuman. 14 pages. “Teenage Mutant Ninja Turtles” by John Dowling. 9 pages.